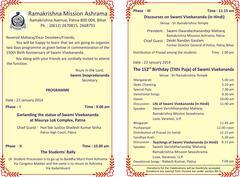 Swami Sivapradananada, aka Saikatesh Maharaj, has sent an invitation to join the programme in commemoration of the 150th Birth anniversary of Swamiji at Ramakrishna Mission Ashrama, Patna. Saikatesh Maharaj recently took charge of the Ashrama at Patna. It's a two-day programme including Swamiji's Tithi Puja.